What Does the P0193 Code Mean? The P0193 code indicates that there exists a problem with Fuel Rail Pressure Sensor. When the powertrain control module (PCM) detects that the fuel rail pressure is outside the predetermined range, it generates the P0193 code. The PCM relies on the fuel rail pressure sensor to deliver the correct information so that it can control the fuel injectors and deliver the required amount of fuel to ensure efficient combustion. The fuel rail pressure (FRP) sensor’s resistance varies with the pressure. As the pressure increases, the sensor’s resistance increases and when the pressure decreases, the resistance also decreases. This change in resistance affects the voltage across the sensor’s terminal and provides a signal to the PCM. A faulty fuel rail pressure transmits an incorrect signal to the PCM causing the P0193 code to generate. How to Diagnose the P0193 Code? and keep it connected at all times when diagnosing the trouble code. An OBD2 scanner is required to read the information contained in the trouble code. There are generally two types of OBD2 scanner: a regular code reader which is available at a low price and an expensive advanced scan code that also includes a number of different features. You can also use a multimeter to measure the resistance but it requires a lot of time and is not preferred. Sometimes the PCM does weird things which cause the sensors to malfunction. A simple way to fix this problem is by removing the negative terminal of the battery and then reconnecting it. This resets all the sensors in the car. To check if the fuel pump is functioning properly, listen to its noise when starting the car. If the car is unable to start but you can hear the fuel pump working, the fuel filter is probably clogged and needs replacement. If the above steps are carried out successfully, the next task is to test the reference voltage of the fuel rail pressure sensor. Start the ignition, then using a digital volt-ohmmeter, check the reading to see if it reads 5 volts. If the reading is not close to 5 volts, the connections need to be rechecked. A lot of times, the P0193 trouble code generates due to an improper ground wiring. To test the ground wiring, connect one end of the jumper cable to a good ground point on the engine and the other end on the negative terminal of the battery. Check the voltage reading before and after connecting the jumper cable to notice the difference. If you notice a better reading when the jumper wire is connected, a ground problem exists. How to Replace the Fuel Rail Pressure Sensor? If you prefer working on your car yourself, you can easily replace the fuel rail pressure sensor at home. However, if you have not performed a replacement procedure before, we suggest that you visit a professional mechanic. Ensure that your car is parked on a flat surface with parking gear engaged. Open the hood and locate the negative terminal of the battery. Remove the negative terminal of the battery to ensure that there is no current in the circuit. You would have to remove the engine cover and look for the fuel rail pressure sensor. It can be found on the top center of the fuel rail. Remove the fuel rail pressure sensor using a screwdriver or socket wrench. You might have to place a cloth towel over the port and a drip pan under the rail. Using an electrical cleaner, clean the harness surrounding the fuel rail sensor. Install the new fuel rail sensor in its place and connect the harness. Make sure to tighten all the screws and bolts so that it remains firm in its place. Reconnect the negative terminal of the battery and start the engine. The average cost to replace the fuel rail pressure sensor is between $260 and $320. The labor cost comes around $200 and $250 while the part itself costs between $60 and $80. The pricing may vary depending on the vehicle and the mechanic’s labor cost. Should I Repair the P0193 Trouble Code Right Away? The P0193 trouble code should be fixed right away as it results in drivability issues. Ignoring the P0193 code for too long can cause damage to the engine and at some point, the vehicle will fail to start immediately. If the above-provided solutions do not help with the P0193 trouble code, reach us out by commenting below and we will get back to you at our earliest. Hi Josh, 2007 Ford F150, crank no start. 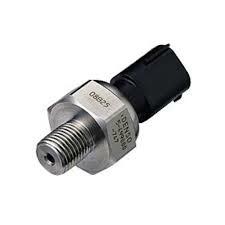 I have no 5 volt ref from PCM to fuel rail pressure sensor. It does share this5 volt ref with the power steering oil sensor. I have checked the wire from the PCM to the connector at the FRPs and its ok. Back probed the wire to the PCM, no voltage. I say no voltage but i checked it with a test light. I also have no codes. I have disconnected sensors to see if it will give an engine check light or code but none. There is communication though to the scanner/ code reader but says the EVAP is not supported. If it doesnt start, check the fuel pressure with a manual gauge and check for spark, ignition. You can also try to see in the scanner if you get any rpms to the PCM while cranking, if not it may be a problem with the timing sync like a crankshaft sensor or camshaft position sensor.